Most Cultures recognize the changing energy throughout the year. Honoring the Sabbats is a way of honoring that flow. These Sabbats are set 6 weeks apart, almost to the calendar day. They are broken into two categories- Lesser and Greater, neither being better than the other. The lesser match the equinoxes and solstices. Spring and Fall Equinox ( Ostara and Mabon) are a time when the days are equal with the nights and therefore are a time of balance, or reclaiming your balance. 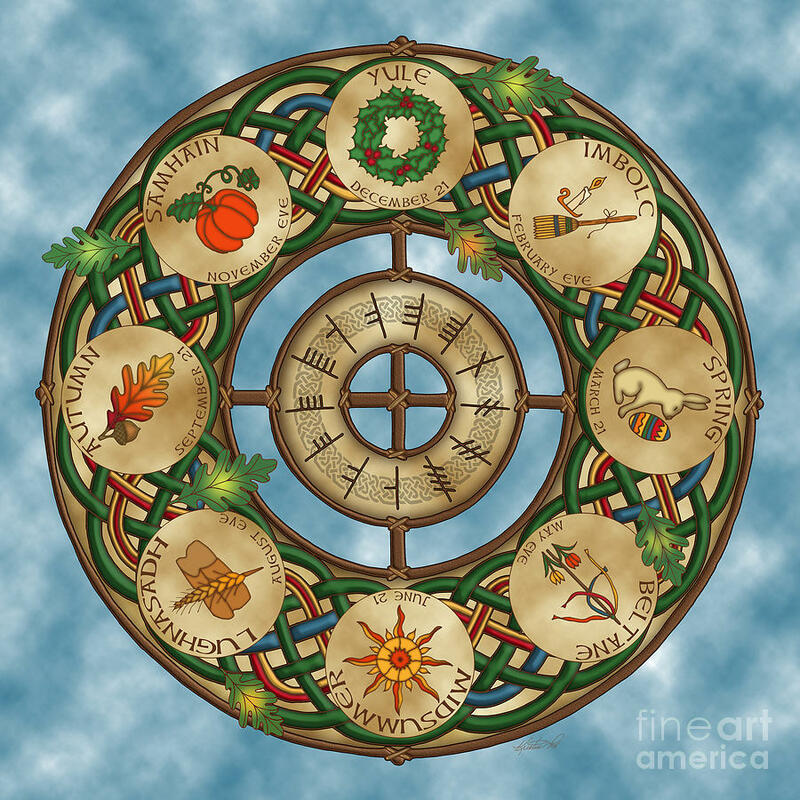 Winter and Midsummer Solstices (Yule and Litha) are a time when the days are the shortest and the longest, marking a turning point in the solar energy. By connecting and remembering the Sabbats, balance is maintained internally to match the balance of the Universe. The importance of these holi - days is to allow the individual to recognize the natural changes that occur in his/her live and the lives of those around. the other purpose is to give us a chance to stop from our hectic lives and take a moment to look around and see what is happening, both universally, and personally. It is a time to collect ourselves . AS ABOVE. SO BELOW. Our Year starts with Yule- Winter Solstice. ( Somewhere around December 21st.) The days are the shortest, and winter is upon us. We have been dormant since Samhain ( October 31st) and are still sleeping. Yet, this is a time when we are re-birthed, re-awakened. We symbolize this through the birth of our God who has died the previous fall. He is reborn. Christians honor this time by claiming their god- Jesus to be born and they call it Christmas. The energy is the same- re brith. Renewal. Hope that the dormant times will end even if we do not see anything happening yet. There is faith that the sun will come back to warm our planet. and ourselves. Yule is a celebration of the darkness, just before it starts to turn to light. for darkness is necessary for us to grow as individuals. Nothing can successfully grow unless it has a time of dormancy first. February 1st is Imbolc. The sap is running in the silver maple trees. While we are still cold and deep in winter, the growing season is starting. Baby animals are being born and the days are growing in length, not quite to a point of balance but to a point of realizing that the nights are not quite so long. Christians call this Candlemas. Candles are lit to symbolize the return of the sun and the return of fertility and productivity. Spring equinox- around March 21st. We are finding balance in life. The days and nights are equall in length and the Sun is making remarkable headways on warming the earth. In our area, we are usually still deep in winter, but the chill is not so pervasive. There is a warmth to the cold. Christians celebrate Easter during this time, focusing on the death of their god for the resurrection into something greater for the good of all of us. We celebrate the balance of life, focusing on the greater good for all involved.